Bringing in the new year with too much partying makes for one Sickly Sam! 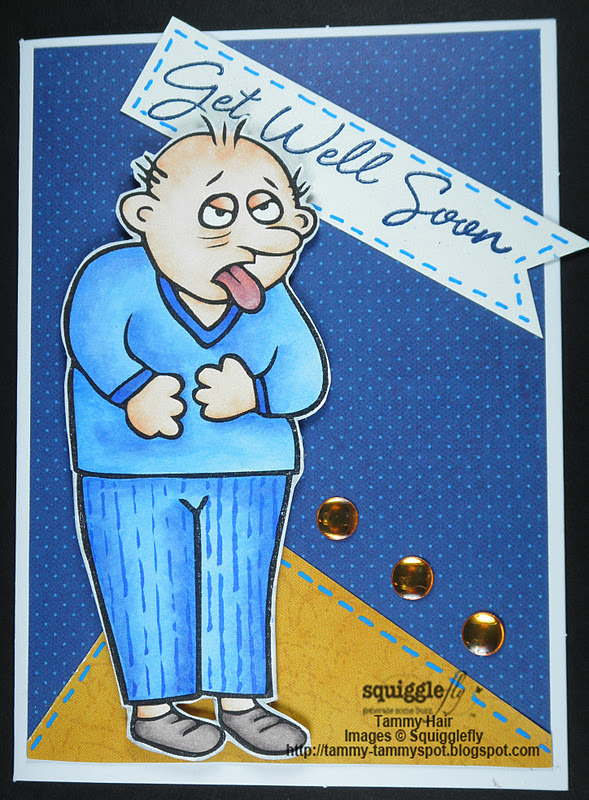 Sickly Sam is by Marlene and is available at Squigglefly. And speaking of Squigglefly, the new teams will begin new challenges next Monday, January 9, 2012. Poor fellow most certainly seems to have been celebrating a bit too much! He looks like he has well over done it lol brilliant card Tammy. Poor Sam! Love this fun layout, Tammy! I always love visiting your blog Tammy - Sickly Sam is perfect for this flu bitten season, isn't it! Great card - looking forward to the new challenges at Squibblefly! What a perfect "get well" card! LOVE it and love your coloring on this too. I'll bet a lot of New Years Eve parties can relate to this guy! Love your shading Tammy! What an adorable and fabulously fun image! I love your card design too, Tammy. I agree with Holly there would have been many sickly Sams NYD Morning.....some may have been sick for days too depending on how much they partied. I hope you had a wonderful New Year and look forward to laughing at your wonderful stories and admiring your fabulous creations throughout 2012. Oh my...he needs to back to bed!!! Poor guy...love your layout, Tammy, and the beautiful colors!!! Hope you had a great New Years!! Lol, oh Tammy this is such fun what a great image I am sure that there were many feeling like that over the festive period, great colours and design.